Ladies Hexham Checked Wool Blend Trousers. Available in 2 Lengths. Ladies flat fronted style trousers with front zip and button fastening. Half lined with side seam pockets and belt loops. Side back waist elastication for added comfort. Classic check in tonal shades of dark teal, spruce and dove on a taupe base. Easycare wool blend fabric with excellent drape. 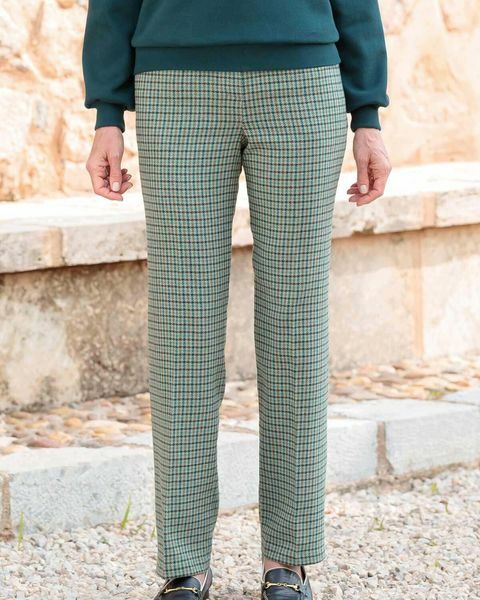 A great, sophisticated trouser. 35% wool/35% cotton/15% polyester/10% acrylic/5% other fibres.